Correcting facial asymmetry doesn’t always require surgery and a long recovery. For example, cosmetic dentistry is an area that you can help contribute to a symmetrical face. Dental treatments such as veneers, ceramic braces, lingual braces, and Invisalign are non-invasive options you can choose from. 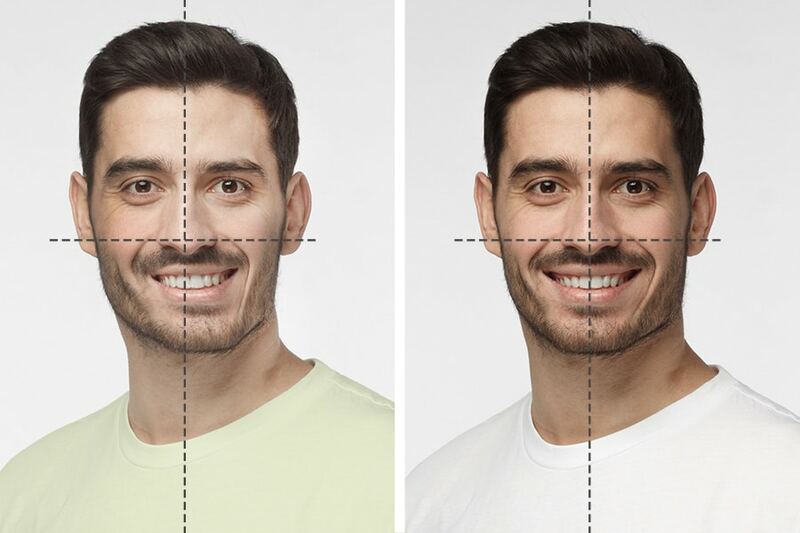 While nobody has perfect symmetry, some types of asymmetry can make your life harder, and not only aesthetically. When it comes to the jaw, facial symmetry is quite important because it can affect the way you eat and speak. Not to mention, it can even lead to pain. In this article, we will explore what causes facial asymmetry and how dental treatments can fix it. What causes an asymmetrical face? There are two types of facial asymmetry: pathological and developmental. It can be caused either by genetics or it can develop due to teeth misalignment, uneven muscles, accidents, and infections. When it comes to genetics, hemifacial microsomia (HFM) is one of the most common conditions that cause severe asymmetry. Fortunately, the gene behind this condition has been recently discovered. Treatment options for this condition vary from case to case. In milder forms, dental treatments such as braces can help as well. Symptoms such as pus and fever require emergency care and shouldn’t be ignored even if the facial asymmetry is minor. In some cases, the asymmetry doesn’t impact the entire face but it can still lead to complications and pain. A temporomandibular disorder (TMD) is usually the cause of jaw asymmetry and it comes with an array of symptoms depending on how severe the condition is. The most confusing part about this condition is that the symptoms come and go. If you’re suffering from an uneven or crooked jaw, TMJ may be the cause. Over time, it can lead to swelling and inflammation as well. This condition is usually kept under control by using anti-inflammatories and painkillers to prevent any swelling or pain that comes with it. How can you find out if you have issues with your facial asymmetry? If you think you have an asymmetrical face, the best way to find out the cause and solution is by visiting your dentist. The first step that will be taken in a dentist’s office is finding out if you need immediate treatment. In some cases, infections cause swelling and the need for treatment is urgent. If you don’t suffer from any infections, an X-ray will be used to examine the bones of your entire face. Depending on the diagnosis, there are several options available, from an orthodontic treatment to a surgical treatment. In the case of underbites, the jaw will come forward, creating an unbalanced look. With overbites, the lower lip comes forward, creating a gap between the upper and lower teeth. The latter may also contribute to snoring and causes sunken cheeks and a weak, narrow jaw. In the past, even milder cases were fixed with surgical treatments alone. In the present, dentists have developed ways to fix facial asymmetry with braces, leaving surgery for more serious cases only. When braces alone won’t fix the issue, surgical treatment is needed. Also, when dealing with uneven muscles or bone structure issues, plastic surgery or jaw surgery might be needed as well. If a child suffers from bone structure issues or uneven muscles, the surgery will be delayed because in the developmental phase the uneven muscles might grow uneven despite surgery. After the child stops developing, these issues can be fixed via surgery. In this case, your specialist will ask for your full medical records to prevent any complications from arising during the surgery. If you suspect that you’re suffering from a case of facial asymmetry, don’t hesitate to ask a specialist about your options. In most cases, facial asymmetry can be fixed by non-invasive treatments, and only severe cases require jaw surgery. However, you must keep in mind that severe cases don’t just affect the aesthetics of your face but also the functionality of your lower skull. In time, this may lead to functional issues, swelling, inflammation, and pain. If you have any questions about dental treatments for facial asymmetry and how you can take action, don’t hesitate to contact us.